This is your all inclusive source for Battlestar Galactica actor appearances. From the largest con to the smallest book signing, we will bring them to you. There are endless lists of conventions on the internet, but there has never been one place to go to find actor appearances, until now. The actors and actresses are listed in alphabetical order. Their role and in which episode they appeared is listed below their names and the picture is their most recognizable role. This will be updated as often as I can. If you have any listings to add, please e-mail me at chairface1@humanoid.net. 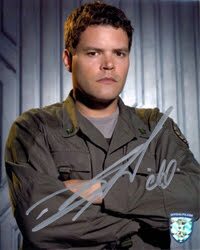 Official Pix has Battlestar Galactica autographed pictures from Aaron Douglas! They are all obtained in person by Official Pix representatives.